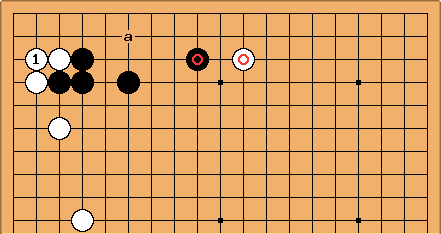 In this and similar invasions is good shape: this hanging connection induces Black at a, and after White connects she has a group that is easy to defend. Black thinks of here as kikashi: after White plays Black has no immediate need to defend at a. 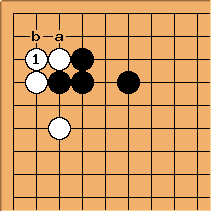 If Black fails to play at immediately, White can play at a as kikashi. This is effectively a double sente position, in endgame terms. Therefore , making White's capture into a large gote endgame play (about 13 points deiri), is urgent. here, the solid connection, is a rare play, not joseki. It is sometimes seen in pro games, in positions where White has reasons to deny Black the kikashi play. One comment about its rarity is that White would then ignore Black at a, to be consistent. But normally White does want to answer Black a at b, giving the same end result. White's group is the better for having the option of the ponnuki capture, too. This is from Yi Ch'ang-ho-Yu Ch'ang-hyeok 1999-09-27. was played, presumably taking account of and . 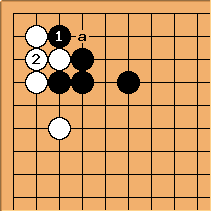 White has retained some interesting invasion aji, at or near the point a.